When it comes to travelling, having no set plans and little intention is the best way to experience any place you find yourself – the best laid plans are no plans at all. This popular belief for most travellers couldn’t have been truer today. We awoke around 8am with plans on slowly enjoying a coffee on the patio, renting some snorkelling gear and heading down to Blue Lagoon Beach, in Padang Bai for a few dives and a day under the sun. 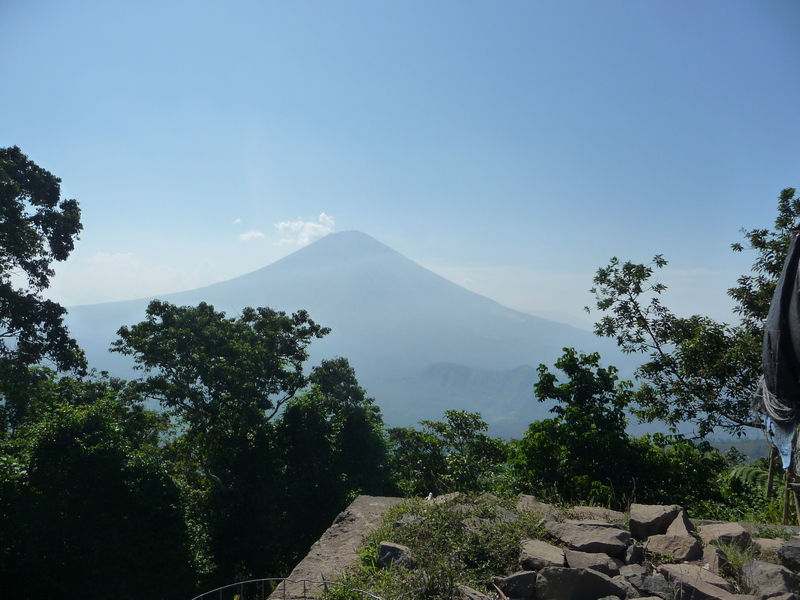 However, as I was glancing down at the tourist map I noticed that about an hour’s drive up the coast was Bali’s smallest volcano, sitting at around 1700m. I figured that because it was the least attractive to tourists it could be climbed without a guide and for a small fee. The more I researched the more I became attracted to this series of temples built on a mountain place named Pura Lempanyung. We quickly decided that we shouldn’t waste any more time and stuffed whatever we needed in our bags, borrow traditional sarongs from the ladies at the guesthouse reception and hit the road. After stopping for a quick bite and paying another police bribe we arrived at our destination in about 1.5 hours from Padang Bai. We were greeted by a friendly Balinese man who spoke incredible English at a pace I couldn’t even follow. He graciously explained to us the route; how there were 1,702 steps to conquer, and how reaching the final and highest temple required walking through a jungle passage with crazy rabid monkeys. He continued to explain how these crazy monkeys are well known for attacking westerners, how many people are bit on a daily basis, how one was shot a month ago (we were shown a picture) and how we should probably take a guide to protect us from these rabid beasts – we decided to roll the dice and save the $20. We made the hike to the first 2 of 8 temples and were immediately captivated by the architecture and view as they sit about 800m above ground and have amazing views of Ganang Agung, a massive volcano in Bali. We took off again and were soon soaked in sweat from the many stairs and hot sun. To make it to the final temple you have the choice of taking the straightest and therefore quickest route, or opting for a detour, which takes you to 3 others temples and provides amazing panoramic views of the valley below, at the expense of an extra hour. We reached our next temple and were greeted by a congregation of about 7 people who simply asked us where we were from and how long we’d been in Bali. Before we knew it they were handing us incense and asking us to join in their ritual. We sat cross legged on the patio stone and felt the trickle of their holy water splash across the tops of our heads as we took part in their quaint ritual of holding a red, white, and yellow flower in the tips of our fingers, holding our hands to the top of our heads for prayer. Without pushing or prodding or asking to be our guides, this family took us under their wing. There were 4 gentlemen ranging in ages 32-53 and 3 elderly ladies in the 60+ range. 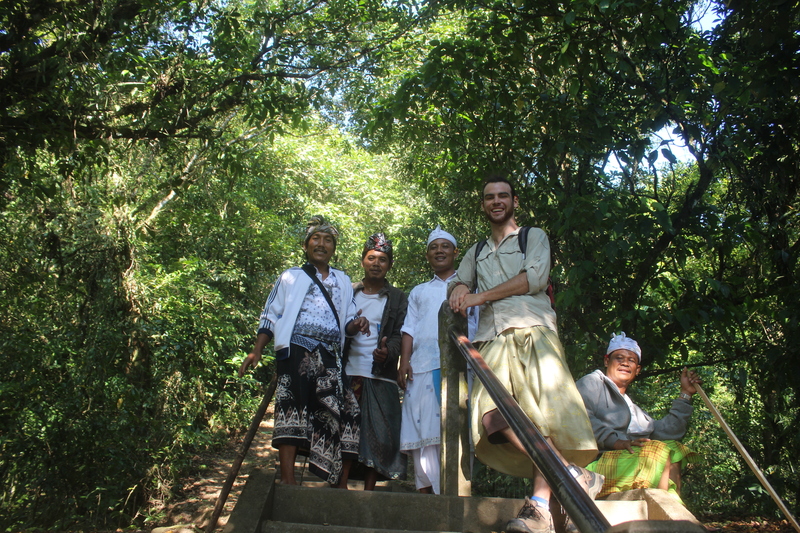 We slowly made our way up each step conversing as best as possible, learning bits of Balinese language, and teaching some English as well – we were simply along for the ride. It turns out they were making the trek to the final temple as well, and we figured it’d be better to travel in a group then battle the monkeys as a duo. We walked together for about an hour before the women decided that the final stage was a little too much for them. So we pressed on, sweating after each step and laughing at the clear miscommunication we were having and the situation we’d found ourselves in. When we got to the second last temple we again set our bags down, pulled out the coconut leaf filled with herbs and flowers, lit an incense stick and began our prayer. We held our flowers to the sky in prayer, and learned the traditional ritual, which involved having holy water splashed our your head, creating a bowl with your hands (right hand over left) and taking 3 sips of the water, then washing your face before finally grabbing a small amount of rice and placing it in the center of our foreheads. This temple was for prosperity in business. 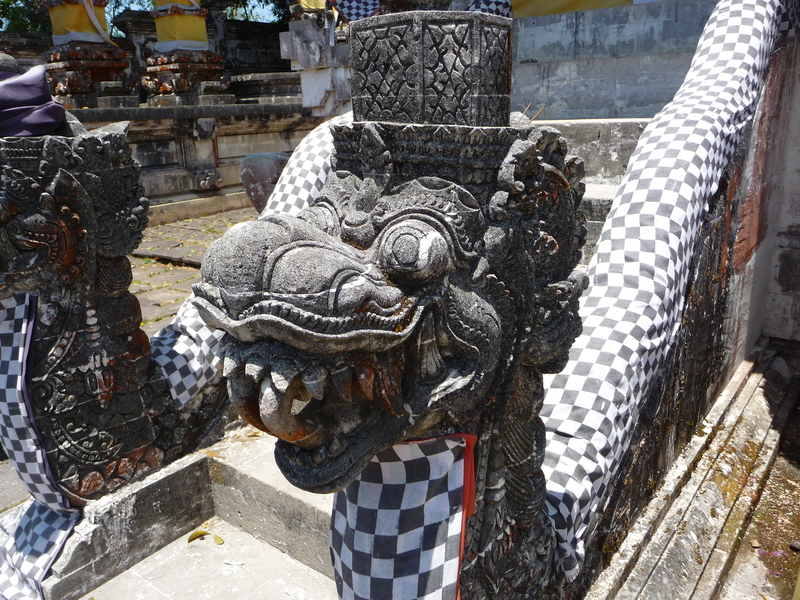 Next, was the final and farthest temple, and the dangerous monkey passage. Since we were with a group of traditional Balinese people, an armed guard joined our fellowship and we were off with beating sticks in hand and a cool looking brute wielding an air rifle. Although at the start of the hike my heart began to race a bit, once I realized that without a guide we’d somehow banded with a group of local Balinese and a man with an air rifle my subtle fear of rabid monkeys was diminished. In fact, we really didn’t see any monkeys, but my friend with the rifle decided to shoot into the trees as a scare tactic anyway. 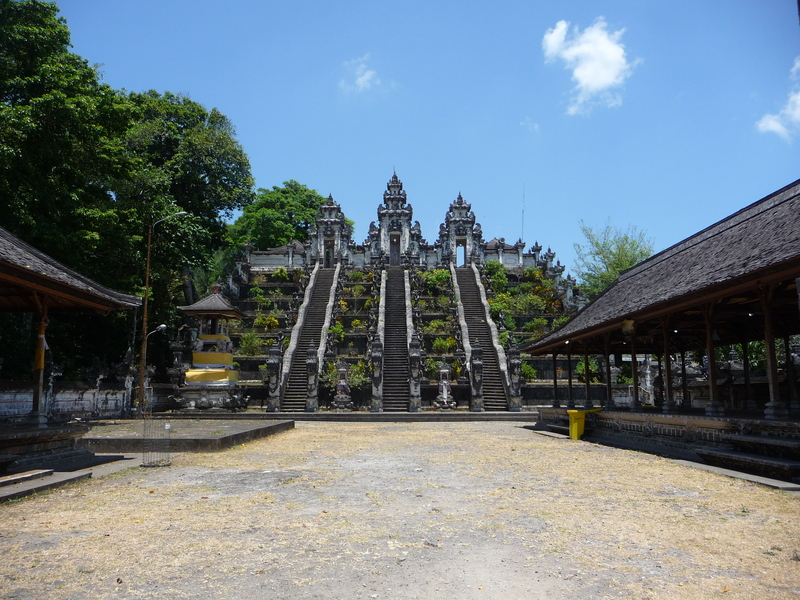 We took the final 1,702nd step and reached Pura Lempayung, the final temple. From this viewpoint you could see large parts of eastern Bali, Ganang Agung, and apparently Lombok across the water on a clear day. Again, we took part in the traditional prayer but this time led by a priest sort of man who seemed happy we’d made it to the top. After it was all said and done, we’d taken about 100 pictures, and began our descent. It was strangely a tough good goodbye as we’d grown quite acquainted with our new friends. We weren’t guided through the temples, we didn’t just see them and take beautiful photos, we were completely immersed in the ritual of these temples and had an experience that is difficult to describe, but certainly left a lasting impression. With no laid plans, and no intention, we had the most fulfilling and influential day of the trip.